Model Mather Louth is one of my photography muses. Her look is timeless, and she is just a joy to work with. For this image, taken in the interior of an antique train car, Mather wore her grandmother's wedding departure suit. The fitted jacket and skirt were plum or aubergine in color, so we added a faux fur stole in a rich forest green to add a hint of elegance. Mather herself is a both a singer and a talented clothing designer, and she actually designed and made this hat herself. 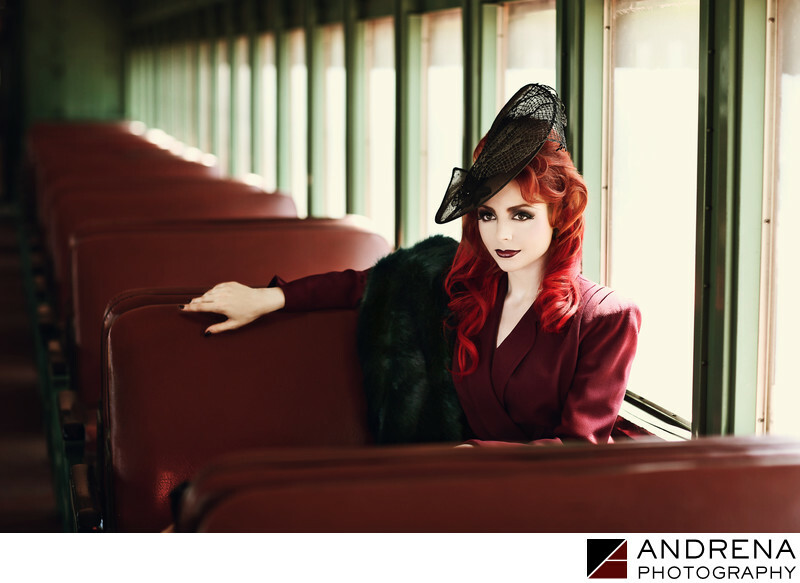 Fashion photography is always enhanced by styling and location, and to make use of this beautiful antique train car, we all drove more than 100 miles. The heat inside the car was astonishing, as it was 105 degrees outside. When you have a large box made of metal and glass that is sitting in the heat, it's reasonable to assume that the temperature inside might be hot. But we had no actual idea how hot it would be. It was like a dry heat sauna, without the spa. We had to keep going outside because we couldn't breathe, and the makeup artist and I each ate about five cold popsicles. Word to the wise: Don't shoot in overheated metal train cars in the middle of the hottest part of summer. Despite how uncomfortable we all were, I think the shoot came out beautifully, and I particularly adore this beautiful image. Photographed in Southern California.